Since childhood, you’ve heard your parents, teachers and toothpaste commercials tout the benefits of properly brushing and flossing your teeth. You were told that these practices would help you fight bad breath and maintain nice, white teeth. Always health conscious, you heeded the words of your elders and made sure to brush and floss as you were instructed, but nobody ever really told you what else these practices effected. But, your dentist is here to clear the confusion and reveal what warrants an equal amount of attention – your gums. The health of your gums is important because they function similar to how soil does. They are the unsung heroes of your oral care. And just like sediment exists before any plant appears, your gums are there before the first tooth breaks through. Therefore, they deserve to be treated with a high degree of care and attention. For, if they aren’t healthy and happy, then the rest of your mouth will slump into a stupor of disfunction. A better way to interpret the importance of your mouth, teeth and gums is to view them as neighbors cohabitating in a symbiotic (depending on each other) environment. Yes, your mouth is its own little ecosystem. When you brush and floss, you remove food particles and bacteria that can attack your gums over time, causing a litany of problems. Thus, your goal is to achieve balance. Here are some of the issues that arise when the delicate balance is lost in your mouth. They are all considered phases of gum disease, and the more the issues are neglected, the more advanced the gum degeneration is. Gingivitis – This is the earliest stage of gum disease, where plaque buildup along the gum line has caused inflammation. You may notice some bleeding when brushing and flossing your teeth, but may not feel any pain. Periodontitis – Whereas the damage done in the previous phase is still reversible, once you enter the realm of periodontitis, the effects become more permanent, as supporting bone fibers that hold your teeth in place are severely damaged. 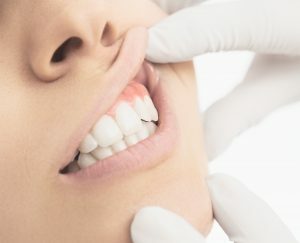 Advanced Periodontitis – This is the result of severe neglect and the final stage of gum disease, where the fibers and bone supporting your teeth are destroyed. This phase can cause your teeth to shift, loosen or fall out. There are several things that you can do to prevent gum disease. One of them is to continue brushing and flossing your teeth twice a day like you’ve always done. Another crucial area to address is your food intake. The higher quality food you eat, like fruits and vegetables, the better your overall oral health will be because your mouth will be less acidic. As a final thought, if you haven’t as of yet, then make this the time that you shift your entire outlook on your mouth, teeth and gums to that of a holistic unit. And remember that if you care for them, then they’ll care for you. Dr. Jocelyn Jensen earned her Doctor of Dental Surgery degree from the University of Minnesota in 2006, and since then has remained committed to improving the health of her patients through state-of-the-art technology and continued education. She practices at Renu Dental and can be reached for more information through her website.